This would all be well & good if the default image selected was actually relevant to the post, but in most cases a random image from the website is chosen. As a website owner, you want your content to look exactly how you intend it to when its shared, not with some random image that has very little to do with the actual post. Here’s a post that I liked a couple weeks ago. You can see that the post I liked was about a “Blue Bentley Continental,” but the image that was shared with the post has nothing to do with a Bentley. Its actually one of the manufacturers Joe’s Stereo carries, and that image was just pulled at random by Facebook. Now I’m sure Facebook will be all over this and they’ll come up with a fix eventually, but in the meantime how do you protect your brand and correct this problem yourself? 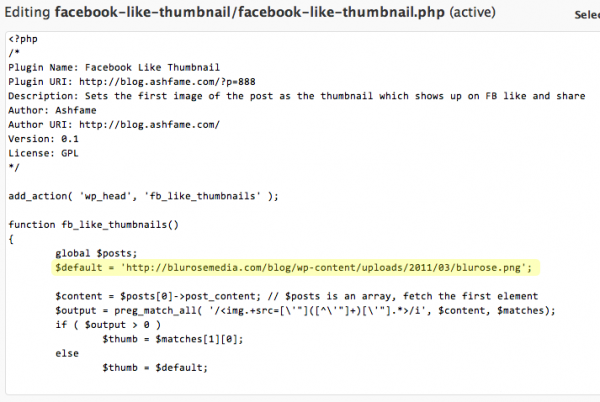 For those of you who have wordpress blogs, the fix is as easy as installing a plugin. Basically all you need to do is download the plugin from the link above OR install the plugin from inside the WordPress admin area. 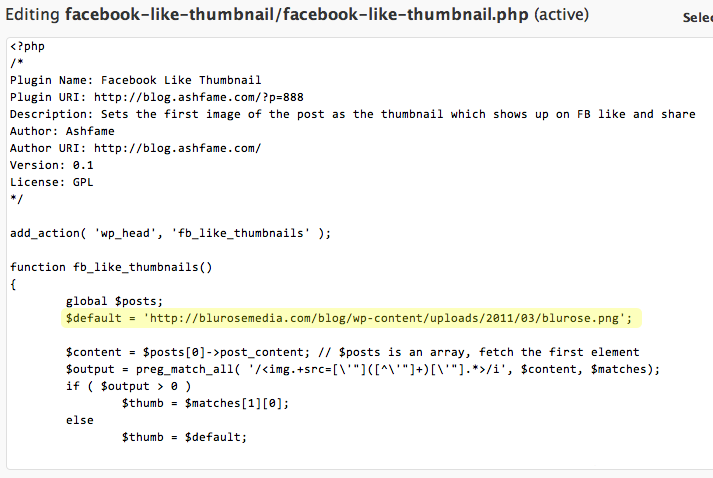 Just go to ‘Plugins’ then ‘Add New’, then search for “Facebook Like Thumbnail.” That should bring up Ashfame’s plugin which you just need to install and activate. What the plugin does is tell Facebook to select the first image from that particular post OR select a default image from the site in the case that there are no images in the post. In order to set the default image, you need do some simple editing to the plugin itself. Once you have it installed and activated, click ‘edit’ from the Plugins page. From there, decide which image you want to be the default image (your logo will work fine), and then enter the web address of that image in the plugin code just as I did in the image below. Save the changes you made and you’ll be good to go! One minor note: the changes won’t take effect immediately because Facebook crawls your site only once every 24 hours. Give it a day or so and you’ll be set until Facebook makes the next round of changes!